Diving off the impressive coral reef in Belize was the first time I considered shooting landscape underwater. Normally, as you can imagine, the focus is on fish, rays, eels, and turtles. I saw and photographed lots of beautiful fish. I also had a glimpse at a green Moray Eel and captured some very decent shots of a Stingray... until he turned in my direction that is -- which caused me to turn tail. (Yes, I read the news headlines too.) I couldn't find him again once the coast was clear. Speaking of clear, the water was unbelievably transparent. I had long views of purple fan coral, giant brain coral, and a host of other thriving residents on the reef. I actually started shooting landscape shots, and on first review on my Mac, they look terrific. But, I had to be very careful while working. This is a very fragile environment. Not so much in terms of nature, but very much so in terms of mankind. It's so easily to carelessly catch a piece of coral with a flipper while treading water or shooting pictures. If you're lucky enough to ever visit Belize, please spread the good word among your diving buddies: keep a healthy distance from the reef. Our cameras are good enough that we don't need to risk the environment to get a good shot. I recorded today's photo with the Canon SD700 IS in a Canon underwater housing. If you know this fish, please post a comment. He's beautiful I think, and he well represents the community I was so lucky to visit. 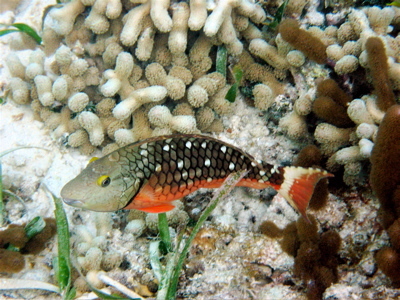 The fish pictured above is a Stoplight Parrotfish. They are common to South Florida, Bahamas, Caribbean and South to Brazil. I have seen them many times while diving. Nice capture with the SD700IS and housing. I think I will buy that set for the cruise I am going on the first week of December. 8 days on the Royal Clipper, a 474' 5 masted sailing cruise ship. Should be fun. Love the podcasts.. listen to them as soon as they are released. May I congratulate you on this masterful post.You have won me over and gained a new reader. in comparison to many of the posts on the web this is a rare find, I am pleased that I came upon your article. I promise to be linking to this on all my sites. Hi there, cheers for a excellent article, a truly great start for the 2010, keep up the fantastic work, Angela. Hi, cheers for a wonderful blog, a really great beginning for the new year, keep up the wonderful work, Claire.